Now that the west end staging yard is operational, it's clear that I'm going to need a lot more freight cars to expand operations. I established a roster of home road and foreign road cars in terms of types and numbers many years ago, and I've been following that loosely in terms of what cars to add to the layout. One of the most glaring omissions has been flat cars. So I recently set out to fix that by building a few home road cars and weathering a few foreign road cars. First up are the two home road flat cars. These are Proto 2000 kits that I picked up at a local show last Fall. I added uncoupling levers and distressed the deck using an Xacto saw blade. I also distressed the ends of the boards on the deck using an Xacto knife. The cars were weathered using artist's acrylics thinned with Windex. Next up is a Tangent Scale Models 50' GSC flat car decorated for the Pennsylvania Railroad. This is an absolutely beautiful model but it is a little fragile. I removed the deck pieces and weathered them separately using water soluble oil paints. I started by sanding the deck with an emory board in the same direction of the boards. At first it didn't appear to make much difference, but I believe some of the grain that appears in the final photos is a result of this process. This was my first foray into water soluble oils and I wasn't pleased with the end result. It looked too dark and more rust-like than I wanted, so I went back over the deck with tan acrylic craft paint. This got the base color closer to the washed out wood color I was trying to achieve. I then went back over the deck with a thin wash of artist's acrylic ivory black and Windex to highlight the gaps between the boards and to add a little more texture. The rest of the car was weathered with artist's acrylics. The last car is an old MDC kit that I bought back in the late 1980's. I removed the cast on grab irons and plastic stirrup steps and replaced them with ones formed from wire. The deck was originally painted yellow and I had lightly weathered it. As this car was relatively new in my era, the deck wouldn't have been subjected to years of abuse out in the elements. The deck never really looked right to me, so I checked a number of sources of online photos and found several from which to work. After painting the deck with Floquil Primer, I came back and weathered it using artist's acrylics. In the paint shop right now are some covered hoppers that have a special story associated with them- stay tuned. 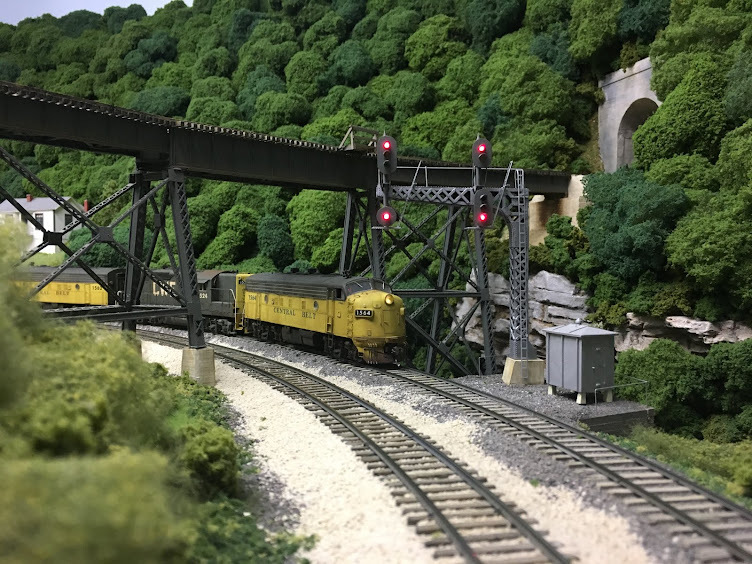 Years ago a member of the Rensselaer Model Railroad Society wrote an article about the "Green Dot Standard" that they had established for their freight car fleet. The goal was to have every car on the layout meet the "standard" which included metal wheels, Kadee couplers, cut levers, and other details that I've long forgotten. This concept came to mind as I was re-working some older freight cars recently. Now that the layout is being operated on a regular basis, having reliable equipment is imperative. And as I add new equipment or refurbish older cars, they must all meet the "JR Standard." The JR Standard is named after Jim Rollwage, whose beautiful Denver Pacific line of the Union Pacific can be seen here: http://www.youtube.com/watch?v=VMUCKyocX-4. Jim was one of the first people to introduce me to operations, and I was amazed at how well his railroad ran. Everything runs smoothly, nothing derails (without operator help), the cars take little to no effort to couple together- in short, everything works just the way it is supposed to work. Operating on his layout is a joy- and it clearly showed me that one could have a layout that operates like this with a little work. Jim's secret is to repair anything that is wrong as soon as it turns up. If a coupler is a little low, the car comes off the layout and gets fixed. If there's a slight kink in the track, the tools come out and it gets repaired as soon as it's found. Over time, with this kind of effort, all of the problems get corrected and the layout begins to operate like it should. 1) Every coupler must be at the correct height and must operate freely. 2) Couplers must be lubricated with graphite. 3) All cars must have metal wheel sets. 4) All wheels must spin extremely freely in truck journals. 5) All wheels must be in gauge. 6) One truck on each car has little to no side to side play while the other has some more play in it. 7) Any car that is too light to track correctly gets more weight. 8) The treads on all wheels must be clean. I've settled on Kadee wheel sets and #5 and #58 couplers for every car. I've heard enough about problems with mixing different coupler types and manufacturers to realize that I don't want to go down that path. Fortunately, I've been installing Kadee wheel sets and #5's from the start, so I didn't have to go back and retrofit these items. The primary issues have been coupler height and/or operation and truck bearings. A little spin with a truck tuner fixes the truck bearing issues, and coupler shims and/or washers on the bolsters have fixed all of the coupler height issues. There's nothing more fun than running a long train across the entire railroad and having everything work exactly as it should. Switching is also a blast, and just about anything that has to do with operating the layout is a joy. For the first time since I got into this hobby over 30 years ago, actually running the trains is as much fun as building them!